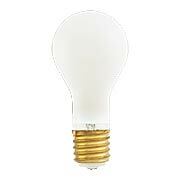 The go-to bulb for candle sconces, ceiling fans and hanging fixtures this frosted flame tip bulb is available in three different wattages. E12 Candelabra base. 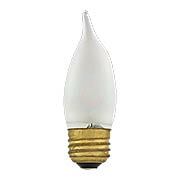 The jaunty flame shape and frosted finish of this E26 standard base bulb is perfect for candle sconces and hanging fixtures. Available in two strengths to chat, eat or read by. 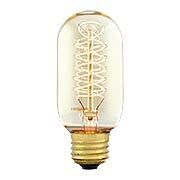 This extra bright three way bulb has the hard to find large base needed for your vintage torchiere lamp. With settings at 100, 200 and 300 watts, it suits everything from reading to illuminating a large room. E39 mogul base. Create a romantic atmosphere with this unique reproduction light bulb. The flat filament dances and flickers to simulate a real candle flame - perfect for those antique wall sconces, chandeliers and enclosed exterior lights! E12 Candelabra base. Create a romantic atmosphere with this unique reproduction light bulb. The flat filament dances and flickers to simulate a real candle flame - perfect for those antique wall sconces, chandeliers and enclosed exterior lights! E26 standard base. 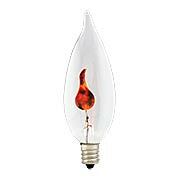 This diminutive flame shape bulb flickers and dances like real candle light. 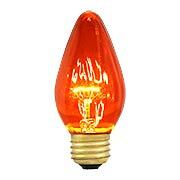 Ideal for sconces, chandeliers and enclosed exterior lights, it creates a warm and romantic atmosphere. E12 candelabra base. 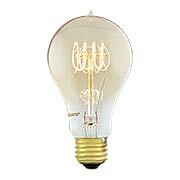 This antique Edison style bulb features a hard-to-find flame shape and candelabra base. The exposed carbon filament produces a dim, reddish glow that creates an inviting period ambience. 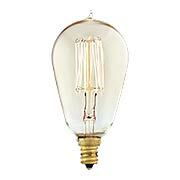 Use them with sconces, chandeliers and other exposed bulb applications. 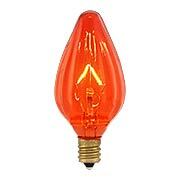 Emitting a deep amber glow, this flame shape bulb is perfect for Arts & Crafts, Art Deco and Romantic style lighting. Paired with sconces, pendants or chandeliers, it creates a warm and inviting atmosphere. E12 candelabra base. 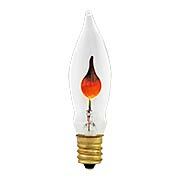 Emitting a deep amber glow, this flame shape bulb is perfect for Arts & Crafts, Art Deco and Romantic style lighting. Paired with sconces, pendants or chandeliers, it creates a warm and inviting atmosphere. E26 standard base. 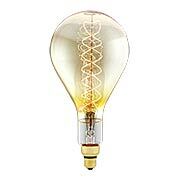 Wrapped in a cocoon of silky silicone thread, this unique "Spunglow" bulb creates vertical bands of light. 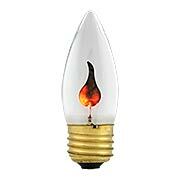 The flame tip shape and soft white light is suited to sconces, chandeliers and other exposed socket fixtures. This Edison inspired bulb is a Steampunk favorite with its glowing cage-shaped filament surrounding a central glass support. Crafted to preserve the look of early 20th-century lighting, at 50 lumens this bulb adds a warm glow to any vintage or contemporary decor. 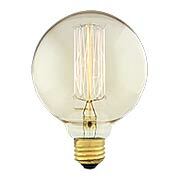 An intricate filament design makes these bulbs ideal for any transparent light fixture, both indoor and outdoor. E12 base fits all standard candelabra base sockets. A long single loop filament suspended along a central glass support gives this Hairpin T9 Tube Light Bulb (30 Watt) a distinctive look. Crafted to preserve the look of early 20th-century lighting, this bulb adds a low warm glow to any vintage or contemporary decor. 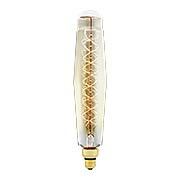 Ideal for transparent light fixtures, indoor or out, it features an intricate filament design and long tubular shape. E26 base fits all standard medium base sockets. This Edison inspired bulb is a Steampunk favorite with its glowing cage-shaped filament surrounding a central glass support. Crafted to preserve the look of early 20th-century lighting, at 35 lumens this bulb adds a warm glow to any vintage or contemporary decor. An intricate filament design and tapered shape makes these bulbs ideal for any transparent light fixture, both indoor and outdoor. E12 base fits all standard candelabra base sockets. A filament suspended in a spiral around the central glass support gives the Spiral ST15 Tapered Candelabra-Base Light Bulb a distinguishing twist. Crafted to preserve the look of early 20th-century lighting, at 35 lumens this bulb adds a warm glow to any vintage or contemporary decor. Ideal for transparent light fixtures, indoor or out, it features an intricate filament design and tapered shape. E12 base fits all standard candelabra-base sockets. 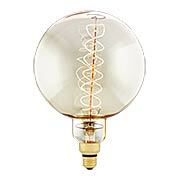 This Edison inspired bulb is a Steampunk favorite with its glowing cage-shaped filament surrounding a central glass support. Crafted to preserve the look of early 20th-century lighting, at 35 lumens this bulb adds a warm glow to any vintage or contemporary decor. An intricate filament design makes these bulbs ideal for any transparent light fixture, both indoor and outdoor. E12 base fits all standard candelabra base sockets. 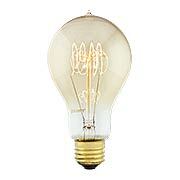 The filament in this bulb is suspended in loops above the central glass support giving it added character. Crafted to preserve the look of early 20th-century lighting, at 35 lumens this bulb adds a warm glow to any vintage or contemporary decor. An intricate filament design makes these bulbs ideal for any transparent light fixture, both indoor and outdoor. E12 base fits all standard candelabra base sockets. 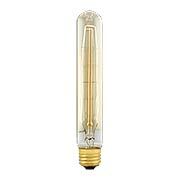 A filament suspended in a spiral around the central glass support gives the Spiral T14 Tube Medium-Base Light Bulb a distinguishing twist. Crafted to preserve the look of early 20th-century lighting, at 135 lumens it adds a bright warm glow to any vintage or contemporary decor. Ideal for transparent light fixtures, indoor or out, it features an intricate filament design and tubular shape. E26 base fits all standard medium-base sockets. This Edison inspired bulb is a Steampunk favorite with its glowing cage-shaped filament surrounding a central glass support. 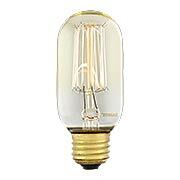 Crafted to preserve the look of early 20th-century lighting, at 135 lumens this bulb adds a bright warm glow to any vintage or contemporary decor. An intricate filament design and tubular shape makes these bulbs ideal for any transparent light fixture, both indoor and outdoor. E26 base fits all standard medium base sockets. 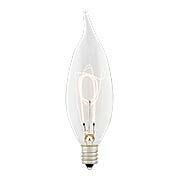 The filament in this bulb is suspended in loops above the central glass support giving it added character. Crafted to preserve the look of early 20th-century lighting, at 55 lumens this bulb adds a warm glow to any vintage or contemporary decor. 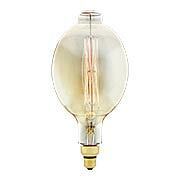 An intricate filament design makes these bulbs ideal for any transparent light fixture, both indoor and outdoor. E26 base fits all standard medium base sockets. 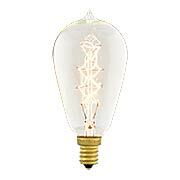 The filament in this bulb is suspended in loops above the central glass support giving it added character. Crafted to preserve the look of early 20th-century lighting, at 60 lumens this bulb adds a warm glow to any vintage or contemporary decor. An intricate filament design makes these bulbs ideal for any transparent light fixture, both indoor and outdoor. E26 base fits all standard medium base sockets. 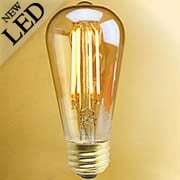 This Edison inspired bulb is a Steampunk favorite with its glowing cage-shaped filament surrounding a central glass support. 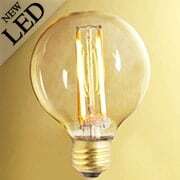 Crafted to preserve the look of early 20th-century lighting, at 140 lumens this bulb adds a bright warm glow to any vintage or contemporary decor. An intricate filament design and globe shape makes these bulbs ideal for any transparent light fixture, both indoor and outdoor. E26 base fits all standard medium base sockets. 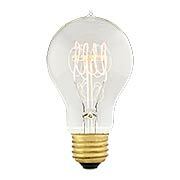 The filament in this bulb is suspended with 23 anchors in loops above the central glass support giving it added character. Crafted to preserve the look of early 20th-century lighting, this bulb adds a warm glow to any vintage or contemporary decor. An intricate filament design inside a standard shape makes these bulbs ideal for any transparent light fixture, both indoor and outdoor. E26 base fits all standard medium base sockets. 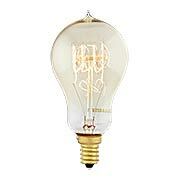 This historic bulb is a Steampunk favorite with its glowing cage-shaped filament surrounding a central glass support. Crafted to preserve the look of early 20th-century lighting, this bulb adds a warm glow to any vintage or contemporary decor. An intricate filament design and tapered shape makes these bulbs ideal for any transparent light fixture, both indoor and outdoor. E26 base fits all standard medium base sockets. A filament suspended within a spiral around the central glass support gives our Jumbo Nostalgic Spiral Bulb a distinguishing twist. 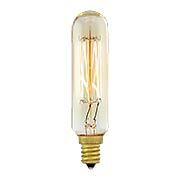 Crafted to preserve the look of early 20th-century lighting, it adds a warm glow to any vintage or contemporary decor, perfect for exposed-bulb lighting applications. E26 base fits all standard medium base sockets. Our Jumbo Nostalgic Squirrel Cage Bulb is a vintage favorite with its glowing, cage-shaped filament surrounding a central glass support. 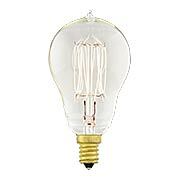 Crafted to preserve the look of early 20th-century lighting it, adds a warm glow to any vintage or contemporary decor, perfect for exposed-bulb lighting applications. E26 base fits all standard medium base sockets. 60 watts, 120 volts. 3000 hours average life. A filament suspended within a spiral around the central glass support gives our Jumbo Nostalgic Tubular Spiral Bulb a distinguishing twist. 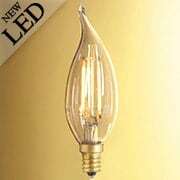 Crafted to preserve the look of early 20th-century lighting, it adds a warm glow to any vintage or contemporary decor, perfect for exposed-bulb lighting applications. E26 base fits all standard medium base sockets. A filament suspended within a spiral around a central glass support gives our Jumbo Nostalgic Round Bulb a distinguishing twist. 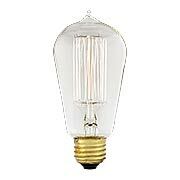 Crafted to preserve the look of early 20th-century lighting, it adds a warm glow to any vintage or contemporary decor, perfect for exposed-bulb lighting applications. E26 base fits all standard medium-base sockets.